How does my story with Istanbul begins? Well, like every story it begins with planning for New Year's Eve in 2010 and having no idea were to go. Finally me and my friends decided that it is time to try something more out of the ordinary European vacations but not to go to much over the edge. The evident choice was Istanbul, a combination between the edge of Europe and the edge of Asia and add on top that it was supposed to be warmer than the usual European Christmas/New Year location such as Prague, Budapest, Vienna or Amsterdam. So there we were, four ladies storming to new horizons on 28 December 2010 after a miraculous taxi trip with a Romanian cab driver that for sure forgot to drink his coffee. Lucky us the flight from Bucharest to Istanbul is a short one and in 2 hours we were there. I am not going to annoy you with tales about touristic objectives and details about our 6 days in Istanbul. 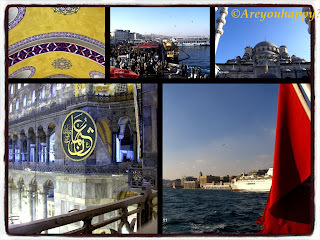 Instead, I am going to share with you some impressions about this city which hopefully will get you excited and make you want to put on your trip list the city about which Atatürk used to say that "On the meeting point of two worlds, the ornament of Turkish homeland, the treasure of Turkish history, the city cherished by the Turkish nation, İstanbul, has its place in the hearts of all citizens." The Blue Mosque (by its real name Sultan Ahmed Mosque) was built from 1609 to 1616 and is still popularly used as a mosque. More than 20,000 Isnik ceramic tiles, huge colorful prayer carpets, the mihrab, many lamps that were once covered with gold and gems, the colored glass of the windows...all impressive and all an introduction to the Muslim faith. Tips - Pay attention to the prayer hours when the Blue Mosque is closed to visitors; recommend you to go in the morning. Make sure you are properly dressed and, if you are a woman, you have something to cover you hair with. Also, be prepared to take off your shoes. Mosques are all over Istanbul. You will notice most of them by their towers (called minarets) and you will "hear" tem when the imams will call people to prayer for the five daily prayers. Do not miss the Suleymaniye Mosque (my favorite because of the interior light and openness and the well known masterpiece of the architect Sinan), Yeni Mosqu (or the New Mosque for the blue mosaic), Iskele Camii (mosque on the Asian side with heated floors), Semsi Pasa Camii (small and beautiful and one of the last works of Sinan). Enter the Basilica Cistern to see the old drinkable water system of the city. The cistern is an underground chamber capable of holding 80,000 cubic meters of water. Go on Yerebaten Cadessi, walk for 10 minutes and on your right you will find a little restaurant called FishHouse. They make the most amazing fried shrimps with butter covered in sweet pepper. Ask for the hot "halva" with ice cream as desert and you will not regret it. Walk on Divanyolu Cadessi to get used to the crowd and the shops as you go towards the Grand Bazaar. When you enter the Grand Bazaar be prepared for a place where you can buy anything at any price. No price list, no strings attached, no rules. Negotiation is the rule and is a cultural thing so it's a must to do it. Here you will be surrounded by gold, sliver, precious stones, smoking pipes, glass, porcelain, lighting appliances, Turkish delights, sellers who are there to sell you just about anything. Check out the paintings on the walls if you are an art lover, the streets with gold sellers if you like jewelry and start negotiation for a scarf. Dolmabahçe Palace was ordered by the Empire's 31st Sultan, Abdulmecid I, and built between the years 1843 and 1856. The design of the palace is a combination between the European styles (Baroque, Rococo, Neoclassical) and the Ottoman architecture. The palace was the primary residence of the Ottoman Sultans for approximately 400 years. The palace had its own water supply, kitchens, dorms, gardens. libraries, schools, even mosques. The imperial harem contained more than 400 rooms for the sultan's mother, the concubines, the wives of the sultans, their children and servants. Tips - take an audio guide at least and you will get a better insight of the Topkapi Palace and it's history. 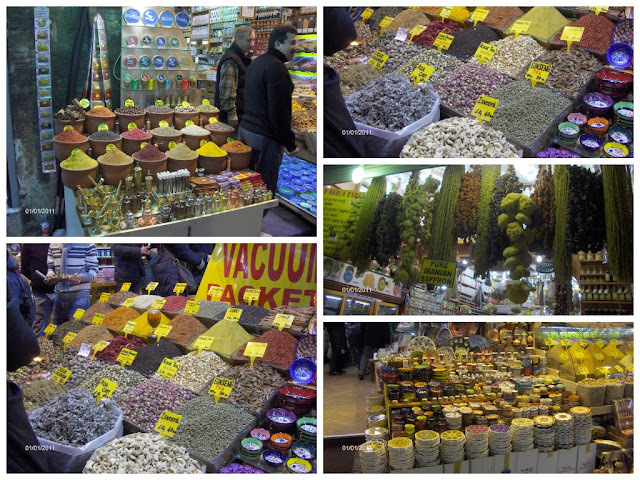 Forget about museums; instead walk the streets near Eminonu Port and go to the spice market. Enter the trains station at Eminonu. It's new and modern but it used to be the last station on the tour of the Orient Express. If you pay attention to details you can still see the old structure of the train station and imagine the passengers of the Orient Express with their fancy clothes just sipping a coffee in the train station coffee place. Take the tram over Galata Bridge and get down in Takism Square. Walk on Istiklal Street for shopping. Shopping malls are to far away and just don't worth the hassle. Here you can find also clubs and bars for chilling. Ada Café (which is a restaurant and a bookshop) has a great New Year's Party. Forget about Coffee House, is to crowded and to European. Choose instead one of the side streets from Istiklal Street and find a small local restaurant were you can drink Turkish coffee and savor a baklava. In the night take the elevator in the Galata Tower; the view on top is amazing. Stop for a while at the coffee place at the last level to enjoy a Turkish coffee with biscuits and watch over the Old City of Istanbul. Take a trip to the Asian side. Ferries leave from Eminonu Port regularly. The trip is no more than 20 minutes. When you get to Uskudar visit the three mosques on the shore. You will notice that people in the Asian side are more conservative and rather curious with tourists than in the European side. Tips - make sure you try the lamb kebab and the local red wine. Ask for starters (zacusca and yogurt with cucumber). Tips - choose the one that is around 2 hours is enough to give you a great view both of the European and the Asian side and a glace at Marmara Sea and in the same time spear you of seasick. ...buy souvenirs, they are cheaper than in other places. 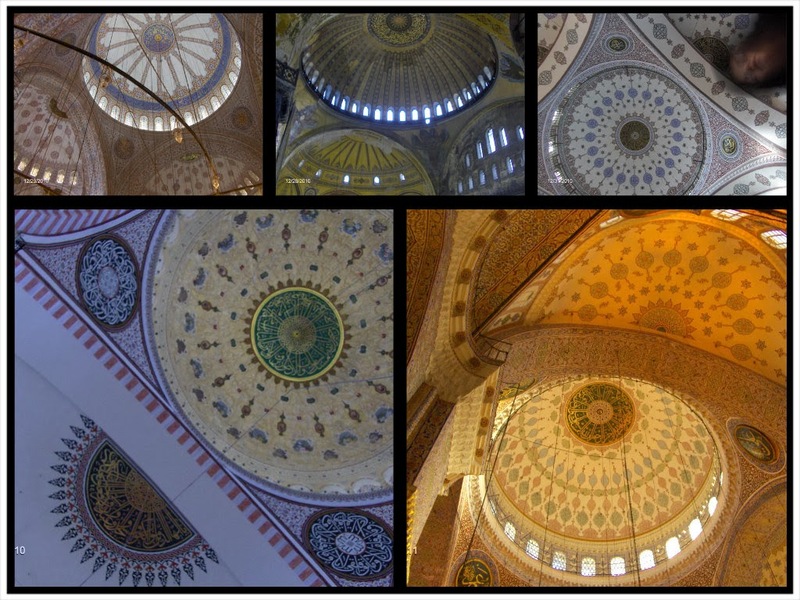 For architecture fans search for a book of Sinan on Istiklal street and enjoy the mosques. Over 400 works are attributed to Sinan. For movie fans, make sure you buy DVDs in one of the DVD/Bookshops - they have a good price and you can find the Audio in English. 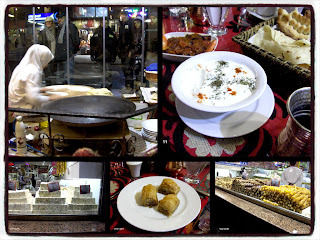 ...for cooking fanatics do not miss the spice bazar and make sure you take home sweet pepper, sumac, mint and saffron. ...for music lovers book a night in one of the restaurants with traditional dances and Turkish belly dance. Teşekkür ederim (which means Thank you) for reading!